Several years ago, I walked into my laundry room and was surprised to see a steady stream of water running out of the ceiling. A puddle rapidly expanded atop the clothes dryer. I stuck a large bowl under the leak, dashed upstairs to tell my son to turn off the shower, and called my plumber. He was quick to arrive but, after a brief look, gave a dire pronouncement. To find the source of the leak he needed to make an exploratory incision into the sheetrock of the ceiling. “There’ll be a lot of dust,” he told me. “What about my mama?” I asked. She was on oxygen and in a hospital bed in the next room, recovering from pneumonia. “Gonna be a lot of dust,” he told me again. I put an “out of order” sign on the shower door and waited. Time flew past. My mother died. The holidays came. I fractured my hand, had surgery, and wore a splint for months. A good time for a mess in my home never arrived, especially since the laundry room entrance is just past the front door. Eventually, another plumbing crisis arose. The toilet in my bedroom ran non-stop. My regular plumber had a family emergency and couldn’t get by, so I called Substitute Plumber. He said my toilet was too old to fix and I should just get a new one. As a dedicated DIY fix-it-upper, a new toilet seemed an absurd solution. Why not buy a kit at Lowe’s and install it? He gave me a detailed explanation I didn’t want to hear and totally ignored. I called my original plumber again and begged him for help. He assured me he would check the toilet when he came to fix the shower, but he was really busy and it would be a while. He didn’t have time for two problems. The constant water running drove me crazy and kept me awake at night, so I devised a very clever solution involving kitchen twine and the float in my toilet. Problem solved. Sort of. I figured it was enough of a fix to keep me sane until the plumber arrived. I really hated the twine device, so I went to the toilet store, just in case Substitute Plumber was right. All I found were porcelain models of the large intestine masquerading as toilets. Of course, you can’t see that if you are seated, but if you are in my bathtub, there’s a great view of the porcelain large intestine. I was certain I could design a more attractive porcelain potty, so I refused to buy a Large Intestine Toilet. Instead, I decided to wait for the real plumber. Truly, I thought I could. It could only get worse…and it did. Next, my shower handle broke. I found my pliers and went to work. Unfortunately, I made the problem worse instead of better. After my intervention, the only way to change from bath to shower mode required the pliers and a good grip. I despaired of my DIY skills. By this time, the guest bathroom shower was out of commission, my toilet was tied together with kitchen twine, and the only way to switch from shower to bath now required pliers and more skill than I had. Nearly crazed by the plumbing, I called the plumber again. He still had eighteen houses but he assured me he would get to me soon. I wondered what he had been doing while my plumbing was falling apart but wisely didn’t ask. You’re probably thinking, “Get another plumber!” but he was the only plumber in my town AND he thought he could “probably” fix my toilet. I was willing to endure anything if I could avoid the Large Intestine Toilet. I finally reached the breaking point. When I called the plumber again, he uttered the most beautiful words I’ve ever heard. “I’ll be there tomorrow,” he promised. He arrived right on time. We had a family Thanksgiving wedding that weekend, but I felt comfortable leaving the plumber in charge. After all, I’d waited years for him to come. Well, really months, but it seemed like years. What choice did I have? I went to the wedding and left him hard at work. I whined and complained about my plumbing for months. I’m ashamed to admit this, but the LIT arrived a week before Thanksgiving and I very nearly whined my way through the entire holiday – all because of the backside of the toilet. A few days ago, while cleaning my bathroom, I encountered the large intestinal curves of the toilet’s backside. A straight toilet would be much easier to clean, I thought and the whining season flashed through my mind. “Count your blessings, sister,” I told myself so I did. First, the LIT stops running promptly and usually flushes promptly. It’s clean and sparkling white. No kitchen twine is required. It’s not a squatty potty. Memories of hovering over a squatty potty in the Middle East stopped me mid-whine. It is not a squatty potty and that’s reason enough to stop whining. The majority of the world’s people don’t have indoor plumbing. How dare I complain about the LIT? Children die every day from typhoid and other preventable illnesses due to poor hygiene. My LIT is perfectly functional (if not perfectly beautiful), yet I still hold to a bit of whining after all these years. I realized a sobering truth today. I’m flexible about a lot of things but I want what I want when it comes to LITs and straight-backed toilets. My self-centeredness is no different from the rest of the world, and I’m so very sorry about it. Whining is not attractive to anyone, least of all to our generous and loving Heavenly Father and it has to go. How do we get rid of whining and complaining? It’s simple. 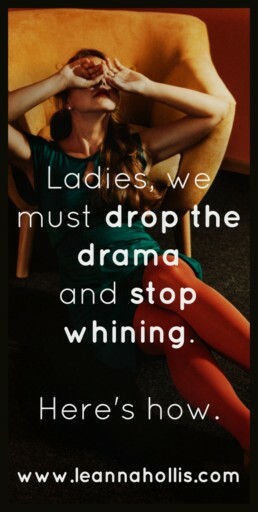 Stop rehearsing the drama, replace whining with intentional thanksgiving and live grateful all year long. I’m probably not the only whiner in the bunch. Have you grumbled and whined about the blessings God has provided? I’d love to hear your story and how you quit whining (if you did). Comment below. Friends, let’s look at the big picture. We may not have all we want but most of us have more than we need. Give thanks, stop whining, and live grateful.